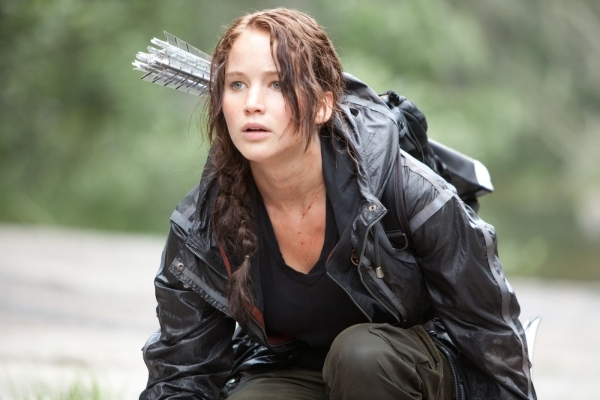 In The Hunger Games, Katniss Everdeen’s idea of a good meal might be a stew of rabbits and the root vegetable that bears her name. A Reaping Day feast could even include a good loaf of bread from the town bakery and a small chunk of her sister’s homemade goat cheese. Fancier fare is reserved for those in the Capitol and, of course, the unlucky tributes chosen to compete in the Games. Indeed, on the train to the Capitol, Katniss’s companions warn her not to eat the rich offerings too quickly since she isn’t conditioned to consume so much fat, salt, and sugar in a single sitting. If only that were true for most Americans. Maybe then, fans who voted for their favorite Hunger Games– inspired recipes and the judging panel at the San Jose Mercury News that winnowed down their picks wouldn’t have selected rich recipes that represent Reaping Day and the fight-to-the-death spectacle that follows. The story’s proposed Hunger Games movie day menu of green broth that tastes like springtime, lamb stew with plums and cranberries, and goat cheese and herb bread weighs in at 1,235 calories a serving. Even before factoring in the theater-sized box of Raisinettes, that’s close to the recommended daily intake for a girl like Katniss. For someone used to hunting, foraging, or going without, eating that feast would surely induce a vomiting episode worthy of its own scene in Supersize Me. Instead, I’d guess that if the fictional heroine of The Hunger Games could sit down to a meal with Suzanne Collins, the writer who created her, they’d choose something more like this menu and skip the trip to the Capitol — and its well-appointed lavatories — all together. Very interesting, I had not expect them to have quite the meal — especially with that size of serving. Interesting! I think I’d prefer a simple home-cooked stew and vegetables myself. Not to mention home-baked bread. Those Amish even have pie for breakfast. I had the same thought while I was reading: this was a gigantic amount of calories for a single person! Thanks for dropping by my blog! I hope you don’t mind, but I put a link to this post in my follow up to cooking the Hunger Games! My pleasure! Thanks for the food for thought!